Large, open-space learning areas are a signature feature of the 21st century school environment. However, how exactly are these ‘learning hubs’ benefitting students? A study published last year concluded that “open plan classrooms are not appropriate learning spaces for young listeners” due to issues relating to noise and concentration levels. 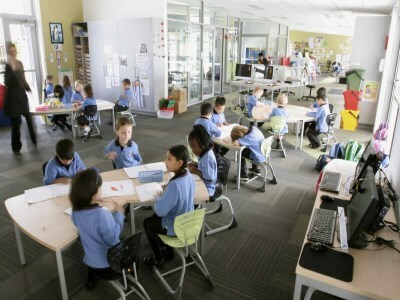 Nonetheless, open-space collaborative learning areas are on the rise in Australian schools. Tony Haydar, managing director at Portable Partitions, recently released a white paper on the growing demand for flexible classrooms and explained how his company’s products are helping meet that need. Haydar told The Educator that while open-plan work spaces help students collaborate, they can also be disruptive when it comes to students trying to focus on individual learning tasks. “We did some independent study into open plan education areas and found that over the last decade there has been a distinct move towards open plan learning areas,” Haydar told The Educator. Other factors include teachers having to raise their voice over large groups of students, distracting classroom layout and the fact that such revolutionary learning spaces remain a largely experimental project when compared to the traditional classroom. These issues are among the reasons why some of New Zealand’s top principals are reluctant to get on board with their government’s $517m plan that will see open-plan classrooms rolled out across the country. Sandy Pasley, president of the Secondary Principals' Association New Zealand, told 3News that principals are not convinced there is enough research behind the idea to back it up. "The big barn-like spaces haven't been researched as to whether they improve achievement. What principals are concerned about is the noise-factor, the focus, the [teachable] time when really students need to focus on what the teacher is saying," Pasley said. Julie Podbury, president of the Australian Principals Federation, told The Educator that the issue is more about flexibility of spaces rather than open spaces. “My experience as a school principal for nearly two decades indicates that the conservative teachers are uncomfortable in anything except the standard classroom, with four walls and limited visibility into the classroom,” Podbury said. Podbury said such teachers particularly “like areas with nooks and crannies” that allows them to break groups of students up into smaller working and discussion groups. While admitting that noise can be an issue, Podbury said she has seen students working in very peaceful open-space learning areas – an observation she puts down to the trained communication styles of the overseeing teachers. “I once stood on an overhead walkway in a British school and observed five classes working very quietly in an open space,” Podbury said. However, Podbury also recalled having observed teachers who “did nothing to change their teaching and communication style” and who make working in an open classroom “almost impossible for their colleagues and the students alike”. “I would expect principals to work with their teaching and learning specialists in schools and consult broadly about such planned changes,” Podbury said. HAVE YOUR SAY: Do open plan classrooms really benefit student learning?